This pioneering book translates the principles and practices of organic farming, cultivated natural systems and sustainable development to show how individuals, teams and organisations can grow their resilience to stress, change and uncertainty, and improve their effectiveness and wellbeing. Alan comments, “There has been huge progress in understanding environmental sustainability in recent decades, but few people recognise that there are similar issues around human sustainability. The human resources in many work organisations are being depleted and polluted in the drive for output: organic farming offers us a simple, vivid, practical model to change this. 7. Real quality: grows from human rapport and wholesome processes. Nature can be a useful model for people and their work, and the most valuable learning comes from cultivated natural systems like organic farms, not nature in the wild. Organic farms and farmers show us how to steer natural resources to achieve desired outputs whilst renewing capacity. 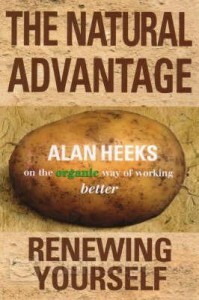 The Natural Advantage is a book by Alan Heeks, combining his experience of starting an organic farm with personal and team development in work organisations. Mainstream industrial or forced farming has illuminating parallels in the workplace, and Alan’s model, summarised below, explores this too. To organic farmers, soil quality is the crucial basis of sustainable output. They aim to continually improve the reserves and resilience of their soil whilst increasing its production. By contrast, forced farming progressively depletes and pollutes the soil, so that output depends on ever-increasing amounts of external stimulant (fertiliser) and suppressant (pesticide), which lose their effect over time. All of this offers us ways to understand, improve and sustain our own ground condition, our reserves and resilience. By cultivating the basis, the sources of fertility, our output at work grows naturally and sustainably. Healthy soil is a living organism which naturally renews fertility and recycles waste. So are people at work! As a manager, use the quality of underlying resources as your key measure, not short-term output. The main energy inputs for organic farms are sunlight, water, air and waste: natural, abundant, low-cost and non-polluting. Forced farming takes most of its energy from non-renewable sources, fossil fuels and minerals, whose residues pollute the earth and water sources. Can you see the parallel in the workplace? Where does your personal energy come from? Often, work output is fuelled by stress, fear, or pressure. Pushing output by control systems, deadlines or heavy supervision, is like using fossil fuel: it builds up residues that reduce natural resilience and fertility. Recall times at work when you felt deeply appreciated, or highly inspired: remember how energized you felt, how the work flowed more easily. Appreciation and inspiration can generate abundant human energy, without polluting side effects, and there are simple ways to stimulate and harness these energies. The beauty of any natural cycle is that there is no waste: every output becomes the input to the next stage of the cycle. The organic farmer composts both animal manure and plant waste to create a major source of future fertility, and this is a key to improving soil condition whilst increasing outputs. Where is the waste in your work that has discarded energy and value? Think about negative feelings like anxiety, or conflicts and project failures. It’s often easier to ignore the waste, and get on with the job, but it builds up within us and around us. Waste is usually messy: it takes new skills to collect and recycle it, but it can readily be done. For example, negative feelings can become a source of fresh understanding and constructive energy. How do you respond to change and uncertainty? There are three common reactions: try to suppress it by imposing control; deny it; or surrender, because it’s all too much. Forced farming can impose control and ignore warning signs for a long period, but problems build up and emerge in catastrophic form, such as disease or nitrate pollution. Organic farmers produce high value and quality with minimal control and amid high uncertainty. They are great examples of how to work with creative tension: using uncertainty, finding the ‘gift in the problem’. By combining our active intent and push with the skills of receptiveness and adaptability, we create a natural process of dynamic growth which harnesses change to create output. Tolerance for ambiguity, within and around us. Developing both intuition and logic, and integrating them. Combining forceful intent with observation and flexibility: the aikido approach. Synergy: using tension and uncertainty to find the ‘gift in the problem’. Assertiveness, creative conflict resolution and other tools to work co-creatively with others. Most workplaces, like forced farming, have a linear, mechanistic approach: input A produces output B, one cause creates one effect. This approach depends upon expensive tailored inputs, and costly, inflexible systems to apply them. It ignores the side-effects and waste which are outputs along with the desired result. Crop rotation cycle: a high value crop, such as wheat, which demands a lot from the soil, is followed in rotation by a lighter crop, such as clover, which renews the fertility, and sometimes by a fallow period when the land is rested. To renew your own energy, try moving from a demanding task to an easy one, or from a structured to a fluid one. The four seasons cycle: the organic farm is aligned with the seasons of the year, from spring through to winter. Apply this to your own work: do you include the full cycle of seeding-growing-harvesting-rest? Even small organic farms have a diverse range of products or enterprises. This creates resilience: if one crop fails, or if demand drops, the overall business can sustain the blow. The various crops support each other: for example, animal waste fertilises plant crops, and plant waste feeds the animals. Rotating land through a range of different crop and livestock uses is a key to reducing weed and pest problems by natural means. The ‘wild margins’ also help in this: land left uncultivated as a habitat for wild insects and plants. The typical large intensive conventional farm is a monoculture: heavy capital investment in one or two enterprises on a large scale, with little flexibility, and high vulnerability to production or market problems. Wild margins are eradicated. Diversity has similar benefits at work. We can increase diversity in the way we work, as well as the range of tasks: for example, rotating between analytical and intuitive, or high and low structure approaches. Our personal wild margins often provide the skills or resilience we need to handle the unexpected. Imagine eating a piece of fruit: how do you judge its quality? Real quality is partly intangible and emotional: it’s about taste, nutrition and the feeling of satisfaction. The produce from organic methods may look irregular, but it delivers real quality. Forced farming is geared to deliver nominal quality: size, appearance, consistency and quantity. The same is true for many work organizations, and the preoccupation with quality certification schemes risks aggravating this. An important feature of real quality is a deep, flexible, two-way relationship between producer and customer. The rapport and trust in such relationships is part of the satisfaction that the product delivers, and this approach enables both parties to accept more change and uncertainty. For example, many organic vegetable growers operate box schemes, where they supply direct to households, who contract to buy whatever crops are in season. Farm visits and meetings, feedback systems and newsletters mean that both parties deepen their understanding and responsiveness to each other. Many work situations push for nominal quality, but it’s real quality that gives sustained satisfaction for the producer and the clients. Understanding the emotional value in one’s output, building direct and dynamic customer relationships, helping the organization to appreciate all this: these are ways toward sustaining high performance.